Casino Club Information is obtained only for casino and affiliate tribal company purposes. The Casino will use the information obtained from the Players Club to send out promotional offers and incentives. Information collected will be used solely for the purposes of marketing and promotions. Guests must insert their Red Rock Rewards card to capture play and accumulate points. It is the member’s responsibility to ensure that the card is properly inserted and accepted for play. Qualification for receiving rewards is based on points properly accumulated during recorded machine play. Points accumulated through misuse of the card, system malfunction or fraud is not valid and will be forfeited. Qualification for receiving promotions, points, and rewards is based on the level of play. Management reserves the right to revoke, modify, or revise the qualifications at any time, without prior notice. Valid government issued photo identification must be presented to initiate any Red Rock Rewards transactions, including being issued a card, additional or replacement cards, or redeeming points. Otoe-Missouria Gaming Enterprises reserves the right to deny any request for Red Rock Rewards Player Club membership and membership may be revoked or canceled at the discretion of the Otoe-Missouria Gaming Enterprise. The Red Rock Rewards Club card and club benefits, including points, are not transferable. In the event of death, all benefits will become null and void. The card can only be used by the named cardholder. Points must be redeemed by the member in person and only at the designated venue. Otoe-Missouria Gaming Enterprises and Otoe-Missouria Gaming Commission make no representations concerning the use of the card and shall not be liable for any loss or damage, however caused, suffered by any person as a result of the use or misuse of the card. Points can be accumulated on a card only by the member to who Otoe-Missouria Gaming Enterprises issued the card and whose name appears on the card. Each member is strictly prohibited from authorizing or allowing any person to accumulate points in any manner on a card(s) issued to that member. Points and membership may be canceled as a result of such activity, at Otoe-Missouria Gaming Enterprises discretion. Points accumulated as a result of unauthorized use of a member card are not valid and cannot be redeemed, including by the member who was issued the card. Otoe-Missouria Gaming Enterprise is not responsible for lost or stolen cards. Lost or stolen cards must be reported to a Casino Team Member. Otoe-Missouria Gaming Enterprise in its discretion may replace lost or stolen cards. Otoe-Missouria Gaming Enterprise and the Otoe-Missouria Gaming Commission assume no liability except for the redemption of properly accumulated points in accordance with the terms and conditions for 7 Clans Player Club. Otoe-Missouria Gaming Enterprise and the Otoe-Missouria Gaming Commission are not responsible for operational errors or malfunctions with respect to the 7 Clans Players Club, including defective cards. Otoe-Missouria Gaming Enterprise reserves the right to adjust point balances as a result of operational errors or malfunctions. Otoe-Missouria Gaming Enterprise and the Otoe-Missouria Gaming Commission reserve the right to revise or cancel the 7 Clans Players Club program in whole or in part, at any time, without prior notice. This includes modifying or discontinuing the availability of items available within the program as rewards and/or the number of points required to qualify for rewards. The 7 Clans Players Club accounts with no activity for 12 consecutive months will be considered inactive. Unredeemed points will be forfeited. If a player self-excludes from Otoe-Missouria Gaming Enterprise as part of Otoe-Missouria Gaming Enterprise/Otoe-Missouria Gaming Commission Self-Exclusion Program, the 7 Clans Players Club memberships will be canceled immediately; any points accumulated will be forfeited. By participating in the 7 Clans Players Club, players agree to accept all rules, terms and conditions of this program. In order to be eligible for 7 Clans Players Club benefits and promotions, players are responsible for notifying Otoe-Missouria Gaming Enterprise of any name, address, or phone number change(s). 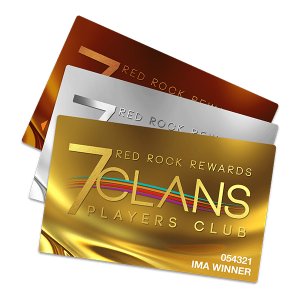 The 7 Clans Players Club card is available for use at all Otoe-Missouria Gaming Enterprises. By agreeing to participate in the 7 Clans Players Club program, all members agree to comply with and bound by these official rules. The attempted registration by a person under 18 years of age or providing any false or misleading information to Otoe-Missouria Gaming Enterprise/Otoe-Missouria Gaming Commission will result in immediate suspension of registration and nullification of points.